In part 2 we continue to explore how you, as a Confident Campaigner, can supercharge your influencer marketing campaigns. In part 1 we focused on how you should have the courage to let influencers create and be creative. In this post we dive into campaign management and how better planning and the use of technology can help you manage, scale and amplify all your influencer activities. Before reading on make sure you've read part 1. Managing multiple large scale influencer campaigns is inherently complex - especially when working with a large numbers of influencers, who are producing content for a number of different channels, at the same time. Working across spreadsheets, documents, calls, emails, WhatsApp messages, Skype and all the social platforms can be a pain and sometimes overwhelming, but couple that with a large list of influencers and you can easily become swamped. It’s not just communications that you will have to deal with. There are lots of moving parts to keep track of, as you look to expand your influencer marketing capabilities. For example: sharing briefs, agreeing creative ideas, approving contracts and fees, arranging shoots, approving content before it goes live, tracking live campaign data and creating up-to-date reports on a daily or weekly basis! It is best to consider and plan how you and your team can effectively manage this end-to-end process, before any campaign begins. 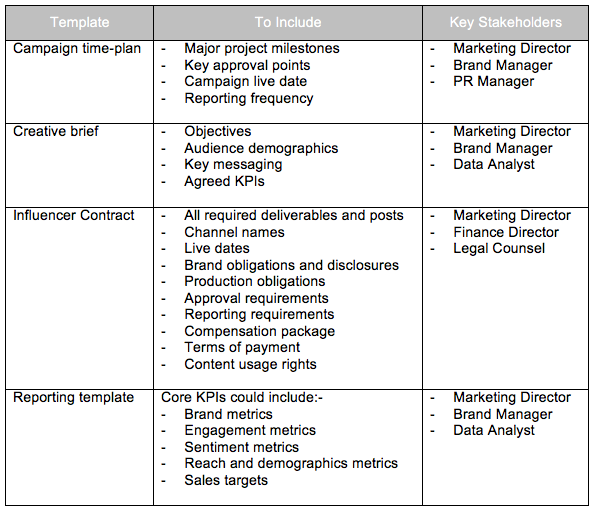 Spend some time with your team mapping out the ideal process for a large scale and complex influencer marketing campaign. Include all the stages of the process, main points of approval (and approvers), key requirements and documentation at each stage (e.g. legal or financial) and the logistics involved to make sure that any change of plan is easily dealt with and managed. For example, what would happen if the Project Manager is off sick, or leaves the business? How does another member of the team pick up the project and understand what needs to be done by when? For this to work and for you to answer this question effectively, you will need to build and agree an internal process that consider these scenarios and permutations. Once agreed, set up internal team training to run through the process from end to end - and continue to review and refine over time. To help you team scale their activities and provide a consistent level of service and quality, it’s imperative that you create a set of core document templates, that are approved by key stakeholders in the business, before being distributed. For example, define what KPI’s are most critical to be measured and then build a reporting framework and template that can support those KPI’s. Here's a list of templates you should consider creating - what to include in them and who should approve them, before they are used on live projects in your business. Multi-channel campaigns can offer a wide range of results and outcomes, but if not managed correctly you could find yourself with a massive pool of data to track, but with no effective way to easily pull it all together. Your biggest headache therefore will be to effectively manage and track these complex campaigns and then produce meaningful and detailed reports that can identify results and trends. For example, to produce a full campaign report every piece of content will have to be searched for and then the data copied into a spreadsheet (via YouTube, Facebook, Twitter, Facebook, Snapchat etc) - which of course is then immediately out of date by the end of the day! Requesting authenticated data (e.g. audience demographics, view time or impression data) especially from a whole host of influencers is not always easy to immediately capture. Data is often shared via screen shots from the influencers, so may need to then be manually recorded. Tracking Instagram Stories and Snaps can be a real issue as the data is often only available to the influencer for a short period of time - with no URL to track, so getting hold of timely screenshots of data from the influencers is key. It is easy to appreciate that capturing all this data into shareable spreadsheets and keeping it up to date is a massive pain and can take hours of time each week - for just one campaign alone. Put systems and tools in place to help supercharge your performance. So, yes, this type of creative approach can be extremely beneficial, and a great way of scaling your influencer marketing activities, but pulling it all together and managing the process and results remain an understandable challenge. Of course to help with this time consuming process, creating an agreed set of templates that are approved by all stakeholders in the business can be key. In terms of campaign management, put in place a technology platform and solution that enables shared information across your organisation and provides visibility along each stage of the process - be it documents, approvals, communications, the creatives and so on. Perhaps the biggest gains can be made by investing in tools that provide the ability to track live data, create reports on the fly and offer the ability to include authenticated influencer channel data, perhaps saving you and your team hundreds of man hours a month. Start supercharging your influencer analytics and reporting today.